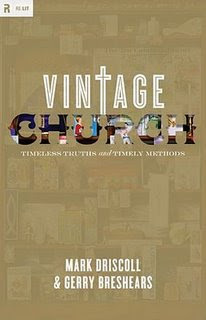 Mark Driscoll: Article and Book : Reform worship. I have rather mixed emotions about Driscoll, but I do like his books generally. Although, right after I read Vintage Jesus (not Vintage Church, but you get the idea), I read Tim Keller's The Reason for God, and that blew me away. Driscoll's apologetics book was good, but I'll never really read it again probably because Keller did so much better on the same topic. Nice to be "talking with you" via all these worship e-mails lately! I agree with you about Tim Keller. In fact, Keller is the most influential national church leader in my life. I particularly appreciate his Gospel-centeredness in all that he says and does, while at the same time not neglecting cultural engagement. There are times I wish I was in an urban setting (like you and Keller), just so I could be closer to the type of ministry that you guys get to do. It is with joy, however, that I remain where I am (semi-suburban, semi-rural, college town, contemporary church), because this is where God has called my family at this point in our life. I would also have to say that Driscoll is quite influential in my life. He is also Gospel-centered, culturally engaging, and has the highest view of Scripture. His structure of church worship, coincidentally, is very similar to my own convictions, but the people of urban Seattle are obviously a different breed than those in Michiana. And although Mark says some crazy and stupid things, for which he elders often correct him, I love his subversiveness to the stagnant American church, that we both believe has compromised the Gospel for culturally accommodated psycho-therapeutic moralism. Agreed about Driscoll. I was actually thinking about all of our e-mails lately that have been sent around, and about what you were saying (which was great to me and very refreshing), and I thought about Driscoll and Mars Hill and they way they do things. So apparently, in my head, this sort of idea is already associated with that church. I love Driscoll's biblical-centeredness and have learned a lot from him. My current semi-paradoxical podcast list is Mars Hill (Grand Rapids), Arvada Vineyard, Mars Hill (Seattle).